Extra smooth Attitude Kajal Eyeliner Pencil gently defines your eyes with rich luxurious colour and a velvety appearance. The long wear and waterproof formula is extremely soft and smooth on application with excellent payoff and coverage. Attitude kajal is not a retractable one but a pencil type kajal which needs sharpening. I don't mind that as long as the product delivers and lives up to its claims. Besides this kajal, I've used the Maybelline Colossal kajal and let me tell you Attitude kajal is way better. It is smoother than the Maybelline one. It is easy to apply and does not sting. I love the fact that it is smudge proof and water resistant. I'm more than satisfied with the black colour pay off. You need to be little careful while applying this kajal as the tip is very soft and can break under pressure. Since it gives a rich colour you can apply it lightly. This kajal lasts for around 7 hours, on the waterline it says on for around 3 hours and then fades lightly (even then it looks good) and therefore removing it is a bit time consuming. You need a good make up remover to take off this kajal. I prefer the Coloressence dual phase make up remover. It removes the kajal effectively. 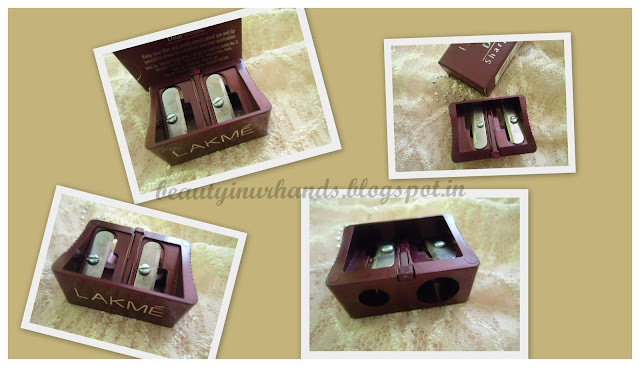 As for sharpening the pencil, I use the Lakme sharpener. The kajal is rightly priced as this product will last long due to its rich colour pay off even though it needs sharpening. I haven't faced any sides effects whatsoever. I would recommend this kajal to each and every girl out there. You got to give this a try and you won't be disappointed. I'll be stocking up on more for sure. Contact lens users (like me) can use this kajal without any second thoughts. 1. Available only through Amway distributors. So you'll have to look out for a distributor in your locality.